In deference to concerns about the use of the word 'inuit' and the 'inukshuk' logo, Aled Williams has changed the name of his new company, IN-UIT Kayaks, to TideRace Sea Kayaks Ltd. The shift in name has been made in respect to the Inuit people, their culture and their identity. 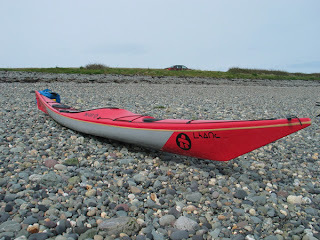 Whilst the branding may have changed, the sea kayaking public can till expect good things to come. Tiderace Sea Kayaks’ high performance coastal touring & rough water design, the Xcite, is now in production and enjoying rave reviews across mainland Europe. Due to the demand for Aled's innovative design, production in Poland has been further increased. Work is now in progress to develop the rest of the 2007 fleet in the form of the Xplore and Xtreme.